If I manage to fit one amazing happening into a day, then I consider the day to have been well spent. Today Krista and I had three amazing experiences. What a day! At 07:30, we walked to the base of the clock tower at Kings Cross train station to meet Tom Bolton. Tom is the author of a very good book about the lost rivers of London. In this book, Tom described how one could follow the paths of London rivers that have now been partially or completely hidden below London’s streets. Each drains into the River Thames. When we contacted Tom, many months ago, he had generously agreed to give Krista and I a personal tour of the lower Fleet River beginning at Kings Cross. At the agreed time and at the agreed spot, we found Tom. We also found two ladies, Rosie and Emma, whom we had met through a group dedicated to walking-as-art who had agreed to join in on Tom’s tour. If Tom doesn’t know something about London’s lost rivers, then it isn’t worth knowing. He guided us through curving backstreets, and along major thoroughfares. With grand gestures he illustrating how the River Fleet, now below our feet, had shaped the composition of modern London. In places we peered through manhole covers to spy and hear the Fleet below us. We heard stories about the industry that had grown along the river, and about the 19th century character of the neighbourhoods through which we passed. We learned that many of London’s street names are based on the lost rivers below, and how the current dividing lines among boroughs trace their paths. Do yourself a big favour – if you or a loved one is a fan of London, buy copies of Tom’s book. You will not be disappointed. After a train ride back to our hotel to collect our gear, Krista and I took a cab back to the Cheslea district to meet with Harry and begin our day’s paddling. 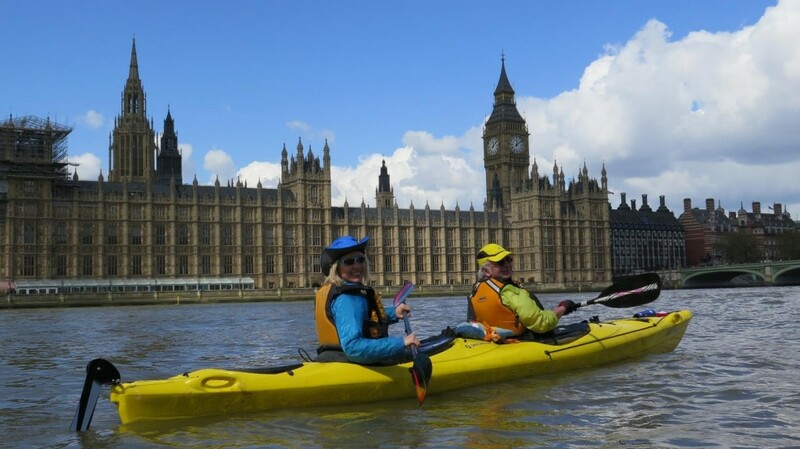 We hauled our tandem kayak, and Harry’s kayak, back across the busy street adjacent to the River Thames’ north bank, and down the remains of the stone staircase to the water. Harry had suggested that we begin our paddle against the remains of the rising tide. If we paddled with the ebb tide, we would zoom through the heart of London so quickly as to miss some of the subtleties that can be seen from the water. When the tide turned, we would get a boost. At one time Harry provided guided paddling tours of the River Thames. (He also once held the record for the speediest circumnavigation of Great Britain – 80 days -, but that it another story). Today Harry kept Krista and I from being run over by a barge or a ferry, while serving as a font of information about the communities and buildings that we were passing. My mind spun as I tried to keep up on the glorious comings and goings of maritime London. Each bridge has one thousand stories. Each neighbourhood has two thousand years of history. And wouldn’t you know it… Both of the photographic/videographic units that we had purchased to document our travels chose today to fail. Harry stepped in by taking dozens of photographs of Krista and I in front of London’s most iconic features. We were smiling in each photograph. As we arrived at the west end of the parliament buildings, the clock struck noon, and Big Ben chimed twelve times. Because we were dawdling, by the time we reached Westminster Bridge, the clock rang for 12:15. On we paddled. At this point, Krista and I would like to give a huge thank-you to the kind folks at the AHOY Centre on Borthwick Street in Deptford, just before Greenwich. The centre is a charity, “changing people’s lives and building life skills through rowing and sailing.” When contacted, they graciously agreed to store our kayaks and gear in one of their boathouses for the night. When we paddled into their facility, we were greeted as kindred souls. 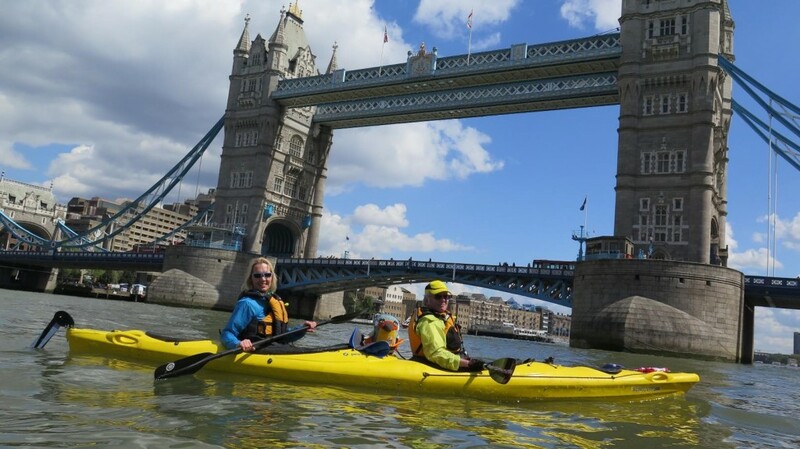 We even received a tour of their set-up from Will and his group, and got to see some of the boats that they are constructing for an event involving groups paddling the English Channel and the River Thames in support of the charity. We sincerely hope that the AHOY Centre will be changing lives for the better for many years to come. I suppose the simplest thing to do next would have been to catch a train at a nearby station to our hotel. Clearly Krista and I are never going to do the simplest thing. Instead we walked to the south entrance to the Greenwich Foot Tunnel, and descended into the earth. For more than a century, Londoners have been commuting from one bank of the Thames to the other using the pedestrian tunnel under the river. Given that I had written an entire blog about the tunnel, it seemed only right that we would use it. I understand that the tunnel has, at times, been a bit shabby, but today it is clean and well-lit, and has two ice cream kiosks immediately upon exiting on the north bank. Do you think that Krista and I got ice cream? Three big Thames-related activities all shoved into one day. Magnificent. Our bodies are responding well to our paddling, day after day. We have overcome the fatigue that comes in the early days of using the same muscles for as much as twelve hours at a go. We have a few tweaks in our elbows and shoulders, but I think that we holding together pretty well. But we will admit that we are getting tired. Ten days of paddling (and dragging) a canoe and a kayak are telling on us. Regardless, we are on track, and eager for the next stage. Tomorrow will be another day in the kayak, with Harry as our guide.